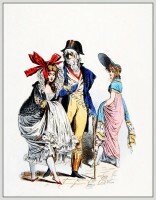 Home » Les Incroyables et Merveilleuses. 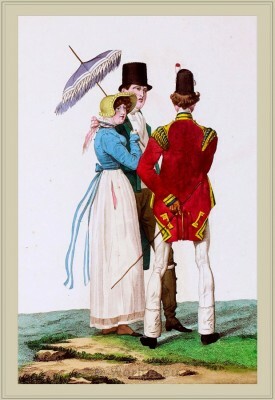 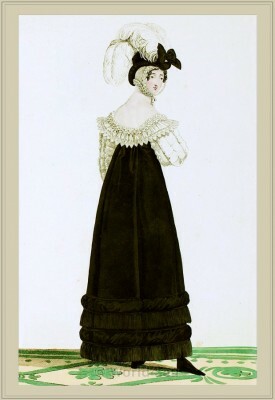 The Directoire and First Empire style between 1795–1804. 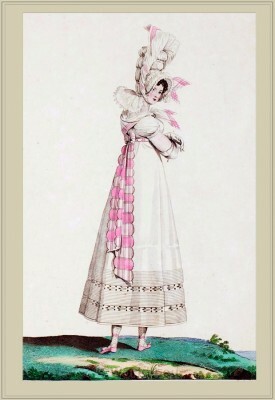 The Fashion of the Merveilleuses. 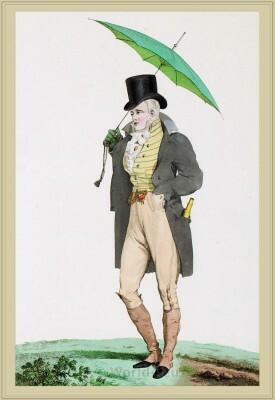 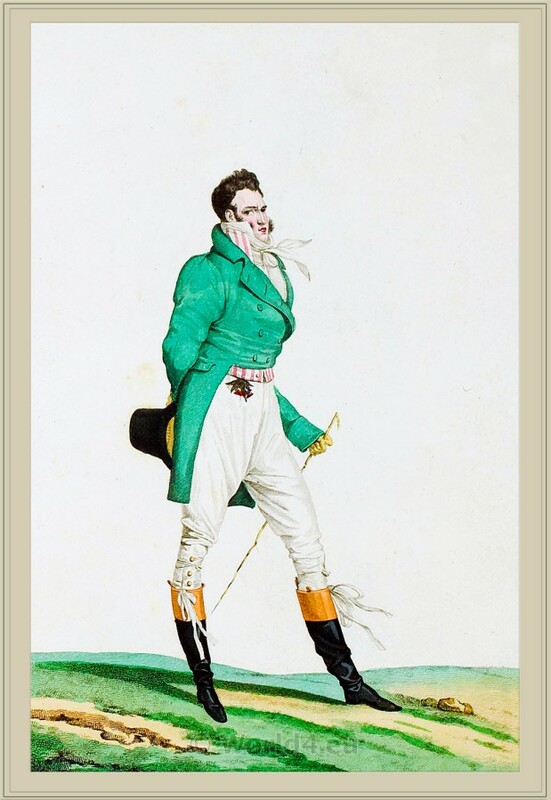 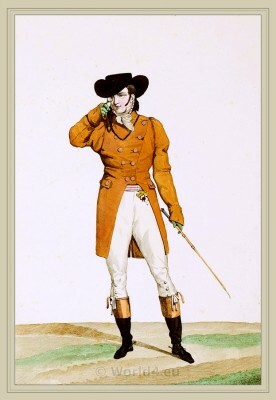 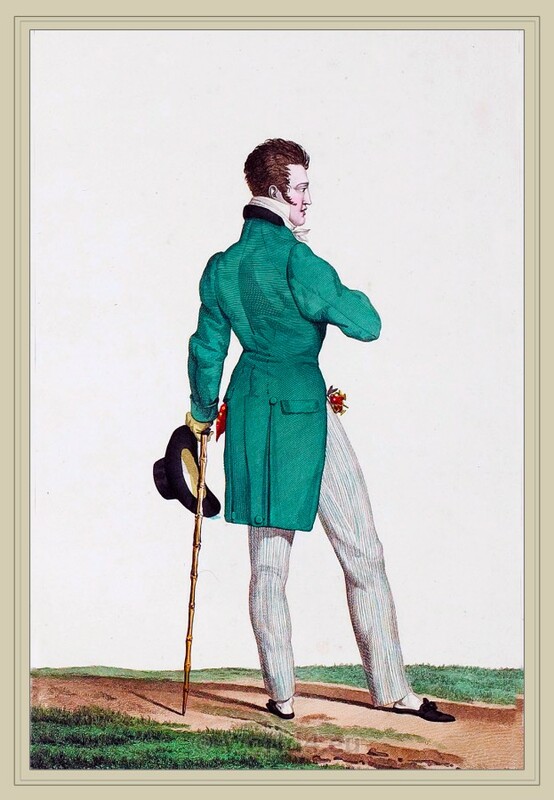 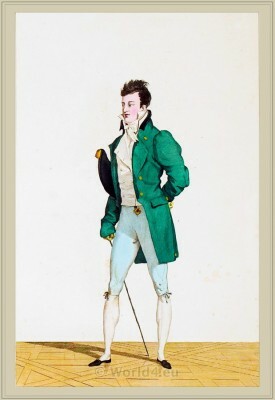 Menswear at the end of the 18th century. Robe de l’invention de Mme. Bouhot. 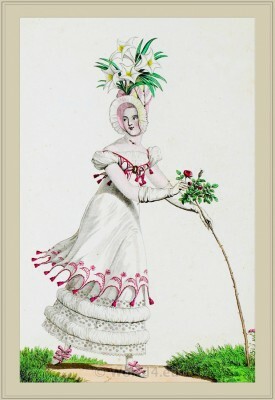 Chapeau de paille Garni de Crêpe. 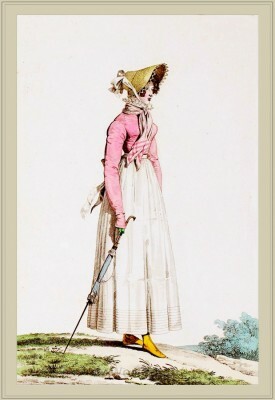 Chapeau de Paille, en Corbeille. 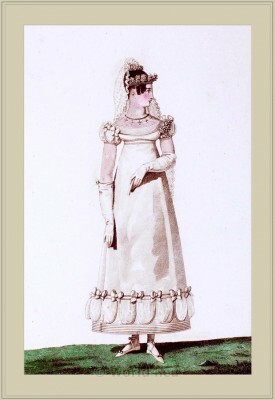 Robe de Bal Rayée en Rubans. 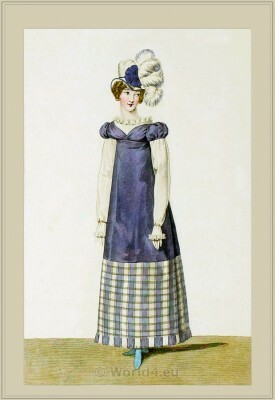 The tubular dress, or round gown. 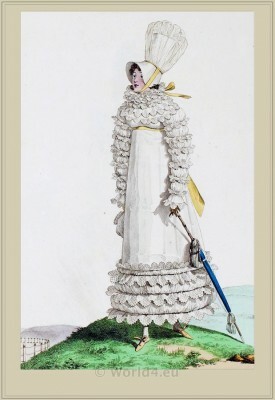 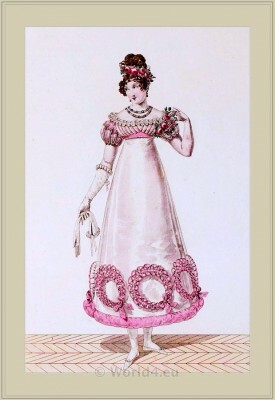 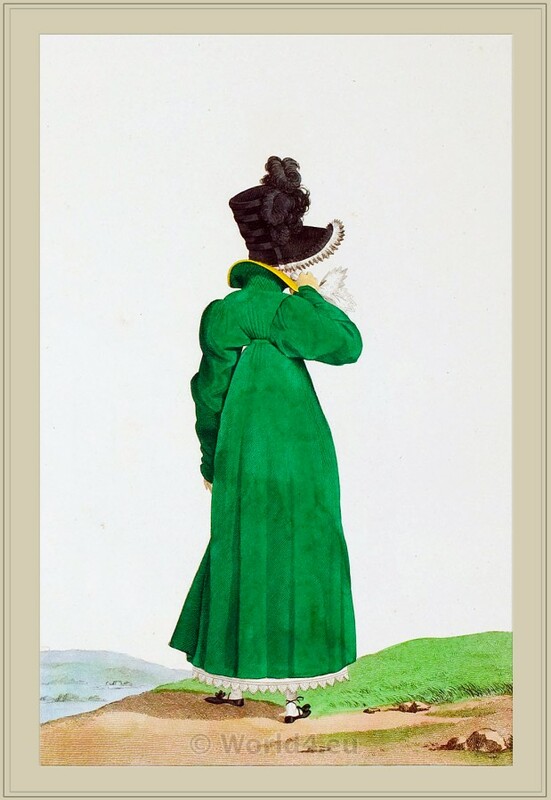 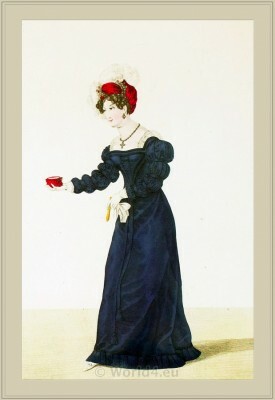 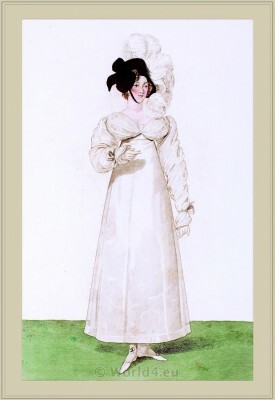 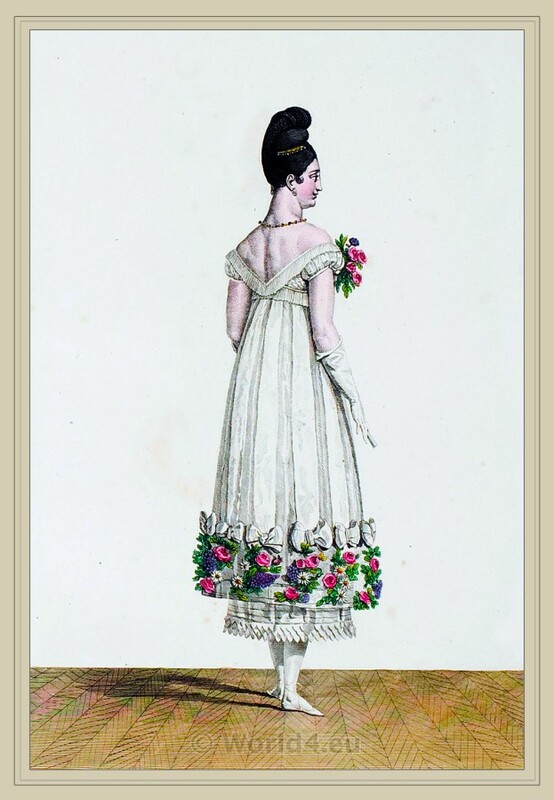 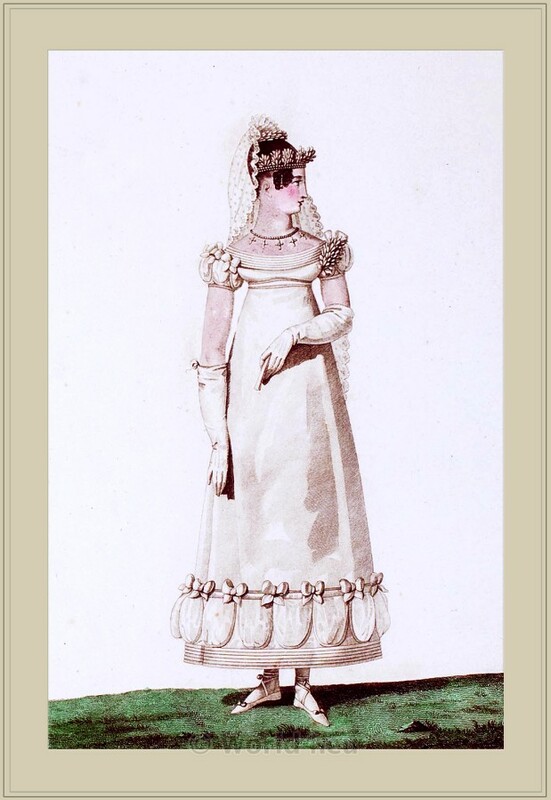 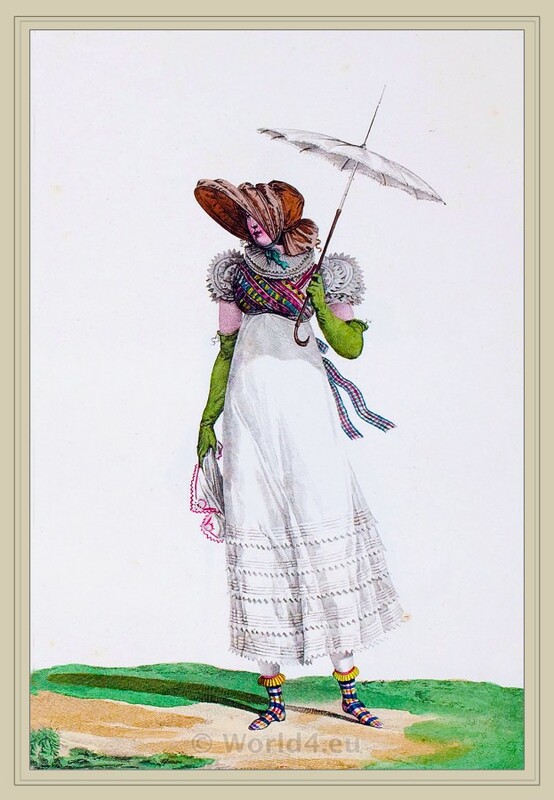 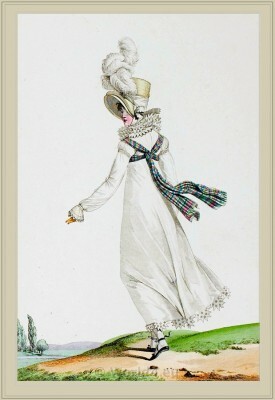 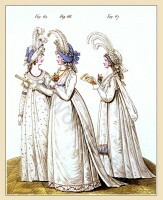 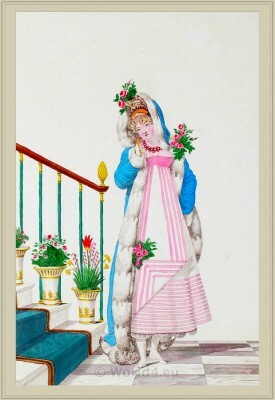 So to the women’s dress of the same period, which has given rise to what are known as the Directoire styles, named after the Directory or later Revolutionary government, this was founded largely upon the Grecian or classic model, but was modified by the military spirit which, originating in the invasion by Prussia, fanned by the French Republic’s decisive victory at Valmy, and later destined to blossom into full flower under Napoleon, had kindled a brilliant flame in the breast of every Frenchman and Frenchwoman. Thus, with the simple garment of “slip” form, which combined in one the corsage and skirt, were worn short coats somewhat of the cavalry soldier type and headwear which often simulated the Grecian helmet. 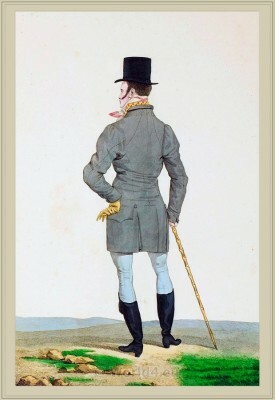 The broad and pointed lapels, or revers, characteristic of the Incroyable, were repeated in these jackets or other wraps, the garment being further embellished with embroidery and buttons of enormous size. 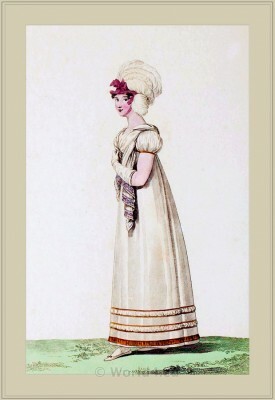 A dress of India muslin, rather short and clinging like damp linen, showed the delicate outlines of her shape. Then she put on a red overskirt, whose folds, numerous and lengthening as they fell to one side, had the graceful sweep of a Greek tunic. This passion-provoking garment of pagan priestesses lessened the indelicacy of the costume which the fashion of the day permitted the women in dressing, and, to reduce it still further, Marie drew a gauze veil over her white shoulders, which the tunic left bare all too low. 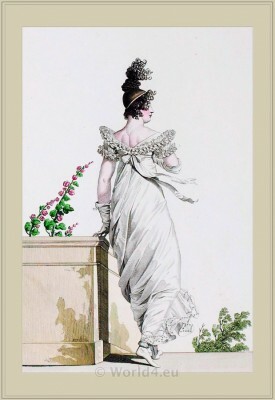 She twisted the long plaits of her hair so as to form alt the back of her head the truncated and flattened cone which, by artificially lengthening the head, gives such grace to the appearance of certain antique statues, while a few curls, left loose above the forehead, fell on each side of her face in long, glistening ringlets. In such garb and headdress she exactly resembled the most famous masterpieces of the Greek chisel. The men’s costume of the later Revolutionary period shows two distinct types, the one adhering somewhat closely to the costume of the Louis XVI period, the other embodying largely what might be described as the modern form of men’s attire. 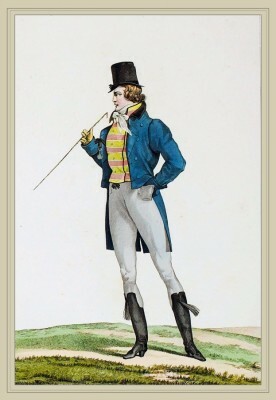 In the first form knee-breeches were worn and the stockings were still visible. The coat, although having a collar and lapels, in form closely resembled the coats of the Louis XV period. 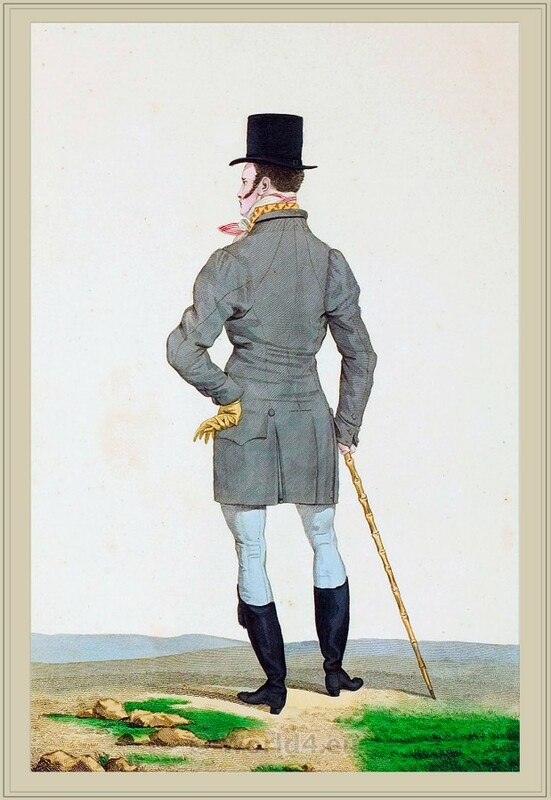 The waistcoat was shorter and, in other features, approached somewhat closely to the modern style, and the loose flowing “Steenkirk” was replaced by a stiffly starched stock, the ends of which were tied in a bow. 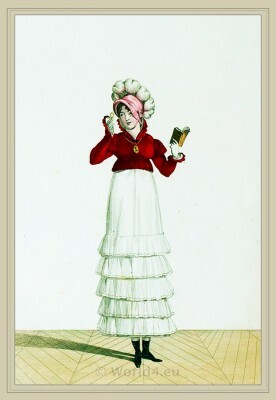 The wig was worn chiefly by old-fashioned men; many young men wore their hair long, having the front portion curled and the long locks at the back drawn into a stiff queue, or “pigtail,” and tied with ribbon. 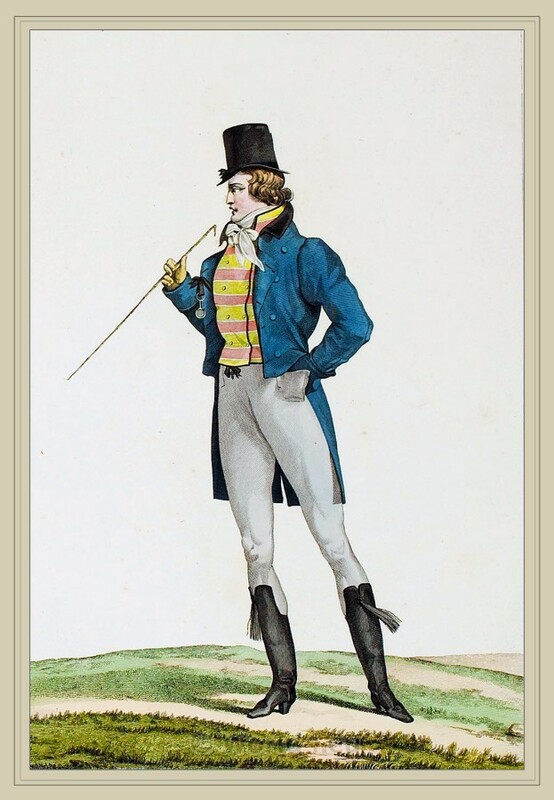 In the second form of costume the breeches were replaced by pantaloons. 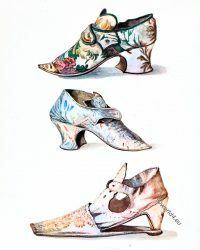 When walking, top-boots or “Hessians,” reaching almost to the knee, were worn, but for house-wear or in the evening the tight pantaloons were displayed, reaching to the ankle, where light shoes or pumps revealed the stockings. 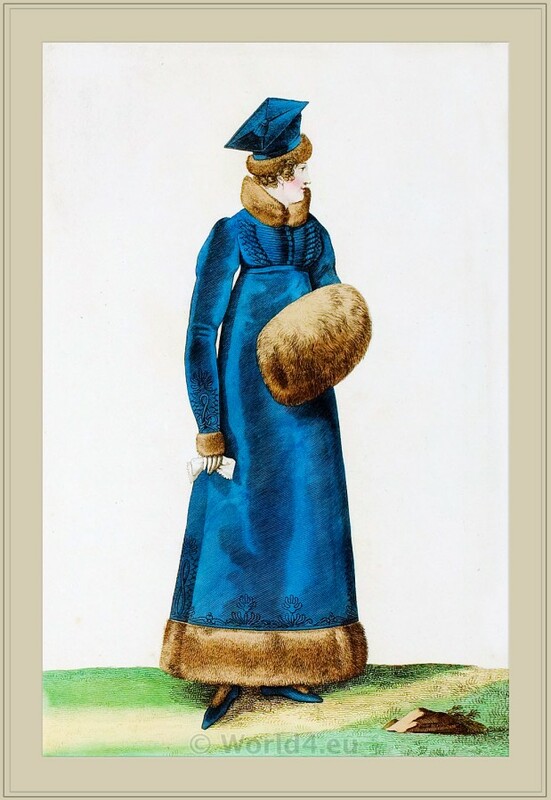 The coat began to approximate in form the dress coat of a later day, being double-breasted, buttoned over the body and cut away over the hips so as to form tails, leaving the front portion of the body and the lower limbs free. 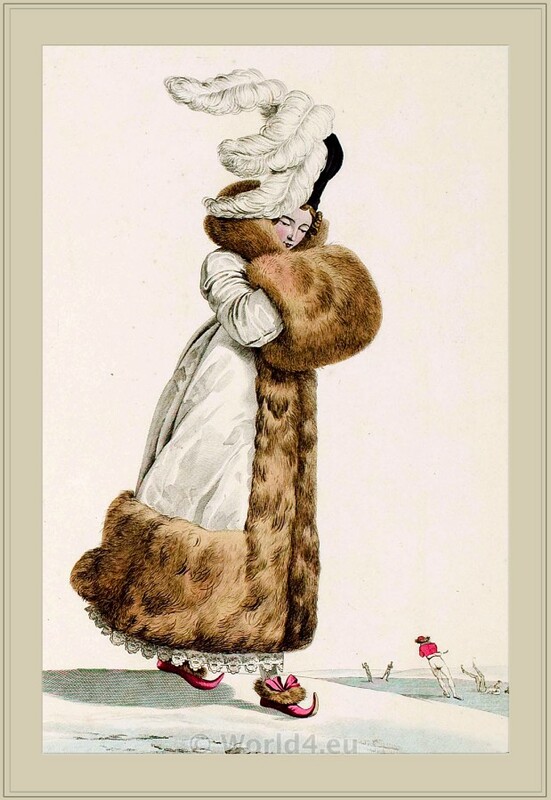 The collar of this coat was very high and the lapels were broad and pointed. 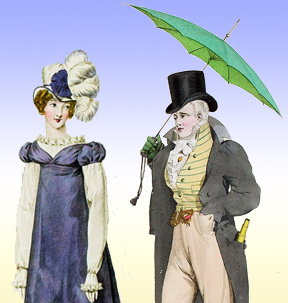 The neckwear consisted of a stock of stiffly-starched pique or similar material, passed twice around the neck, the ends being tied in front. 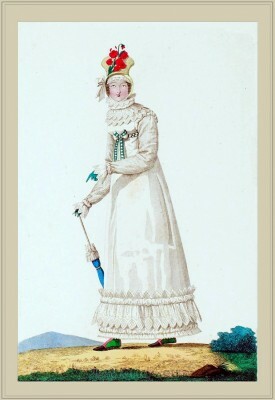 Costume Redingote de Mérinos, doublée d’Astracan. 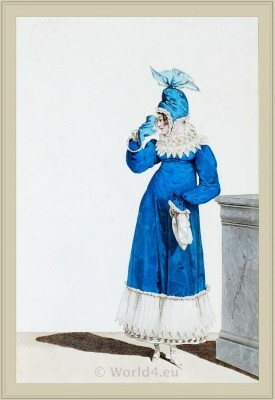 Costume Robe Garnie en Chicorée. 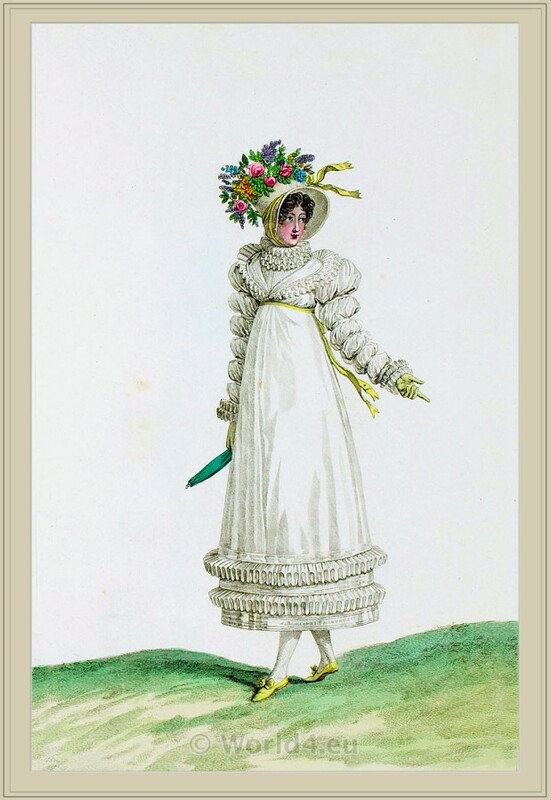 Coeffure Chinoise.